Join the discussion on our forums! 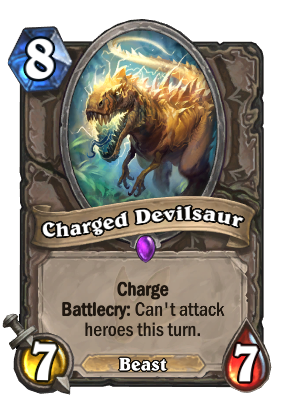 Come discuss Charged Devilsaur over in our dedicated Charged Devilsaur discussion topic. Battlecry: Can't attack heroes this turn. What happens when a dinosaur mixes soda and pop rocks. So... this card STILL managed to be used in OTK style decks. This is why rush was invented. I wonder if they'll change the text to Rush now ... would essentially be the same thing, except that cheating it out or resurrecting it would not allow you to target Heroes. They dont even have to alter mechanics tbh. Make its text: Charge. Battlecry: Gain Rush instead. Carnivorious Cube finds Charged Devilsaur to be Delicious. Better than King Krush by being in a better mana slot, and open to all classes, despite not being able to go face. Wtf I just aummoned a copy of this through menagerie warden but the copy couldnt smorc?? Why is that? we had Icehowl and now this. PSA: If you get this from Free From Amber, you can actually SMOrc with it because the battlecry doesn't activate while the Charge stays! Blizzard your killing the Smorc hype with cards like this. What is the point of making an 7-7 Charge minion if it cannot be used as a finisher? Correction: A King Krush for every class. So its still a bad king krush. But now Every class has one! Wouldn't you be able to work around the battlecry with cards like Y'Sharjj or Goya in order to hit the face? If that's the case this card could see some use in decks that utilize those cards. That thought occurred to me as well. Like, imagine getting this guy from Forbidden Shaping or the new Free From Amber :O ! Could even work with Giant Anaconda if you're able to trade on your own turn. Y'Shaarj, Rage Unbound pulls a card after your turn ends so it doesn't work. I like the way Snrub thinks though.